The Professional Development Institute has provided recognized career learning on-demand to tens of thousands of decision-makers in the public service to advance their knowledge and career prospects. The new i-Governance program adds depth and breadth to this professional development, and convenes specialty sessions on today's vital topics under Chatham House rules for senior public sector leaders, drawing on Canadian and international experts. Programming at i-Governance evolves as issues emerge. Events such as conferences, seminars, discussion groups and keynote presentations are designed to inform leaders and policy makers at all levels of government. In partnership with the Professional Development Institute's i-Governance initiative, the next GovTech Summit showcases canadian artificial intelligence. Hear directly from small and medium sized companies through our pitch series highlighting their alignment with the federal government’s priorities. The GovTech Summit series is designed to facilitate regular interaction between the public sector and specific industries aligned with federal government priorities. 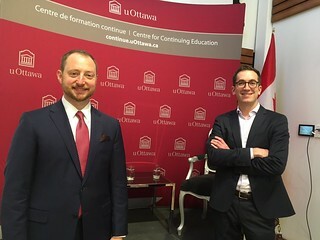 Beginning in the spring of 2019, the i-Governance series will host a monthly informal luncheon for a limited number of vetted guests to hear from a foreign Ambassador or High Commissioner to Canada. This geopolitical perspective on our times will be followed by Q & A and informal discussion. Chatham House rules apply, and no media will be present. This luncheon series will be of interest to senior government officials, NGO leaders and C-Suite executives with an interest in the dynamic and evolving landscape of current geopolitics. Sign up to the Professional Development Newsletter to receive information on these upcoming events. Find below links to the conference synopses and download the recommended resources of past events offered under the auspices of i-Governance.